Do you dread figuring out what to pack in your kids’ lunch boxes like I do? I’m always on the hunt for new school lunch ideas, especially at the start of a new school year. Coming up with a variety of school lunch choices is one of the hardest tasks for parents during back-to-school season. Even if we get #1 through #4 figured out, a lot of the easy options aren’t as healthy (or cost effective) as we’d like for them to be. So, being the organizer/planner that I am (or try to be), I was determined this year to do something about these problems! My motivation came from my 11-year-old, whose only request as we were discussing this topic was: “I don’t ever want to see another cup of yogurt in my life.” We obviously got stuck in a yogurt-filled rut last year when we ran out of other ideas! Every time I researched ideas online, it seemed like all I found was cutesy pictures of fruit cut into flowers and whatnot. I concede, flower-fruit is totally cool. But who has the time? Because the fact is, I most of us don’t need 76 new recipes to learn. We just need a basic list of easy-to-make ideas and maybe a few new recipes to try out on the weekend, obtain kid approval and add to the school-lunch arsenal. With my kids’ help, I compiled a one-page list of ideas, broken down by category (Main Dish/Protein; Veggies; Fruits, etc), and included 10 new recipes for you to try out. Attach to your fridge or inside of a kitchen cabinet (where you’ll see it frequently). 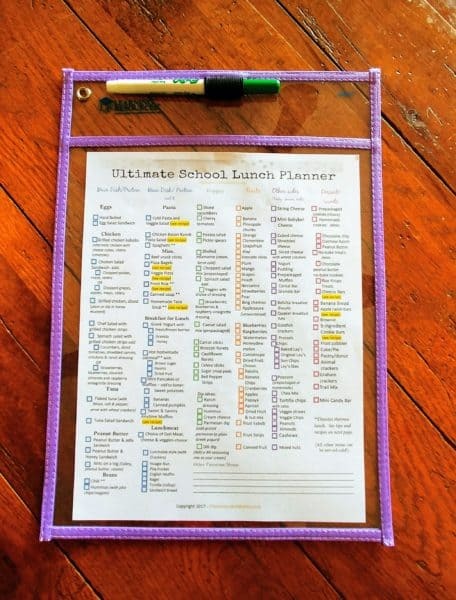 Using a fine-tip dry erase marker, go over this list with your kids and check off the items you plan to buy/pack for lunches during the week. Use this list to help make your grocery list, and to remember your plan throughout the week. Wipe off & repeat each week! Overall, these are healthy, common sense ideas and recipes that are budget-friendly, easy to prepare, and with ingredients readily available at any grocery store (with the exception of some seasonal fruits & veggies of course). I decided to include mostly cold lunch ideas for kids, with the exception of a few thermos lunch options. The items on this list are all things that my kids eat regularly. I’m a pretty avid label-reader so if you’re wondering why I picked certain specific items, it’s likely because I feel like it’s a good choice for my kids, it’s a budget-friendly option, or it’s the “lesser evil” out of the available options for that category. For example, I prefer to buy Baked or Original Lays chips instead of Cheetos and unsweetened applesauce because of the high sugar content in other varieties. 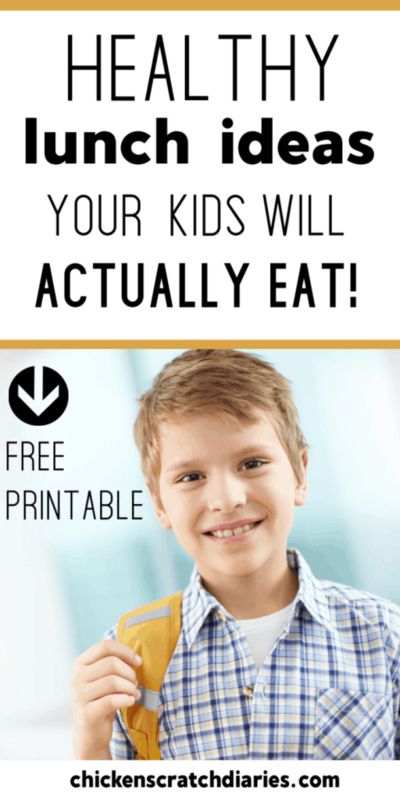 Although yogurt is still an option on the lunch box planner printable, there are certainly MANY more options that will make my kids happy- and I’m sure yours as well! Even for my picky 3rd grader, there are TONS of things she will actually eat on this list. So, enough of my rambling- you’ve got lunches to pack! 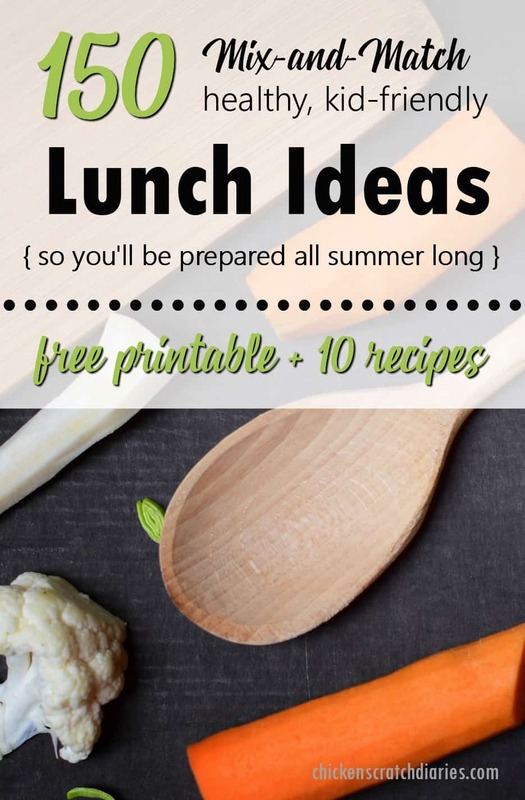 I’m offering this FREE printable School Lunch Ideas Checklist + 10 Recipes as a gift to email subscribers. See box below! 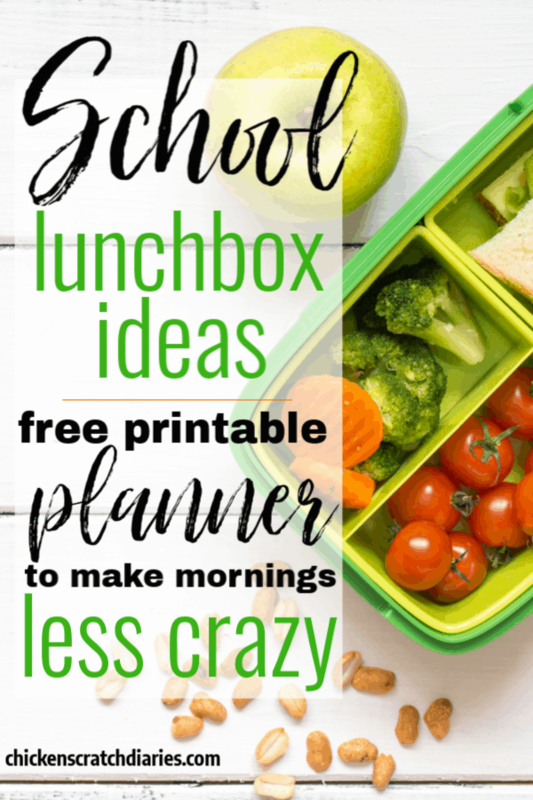 I hope these printables make your lunchbox planning much easier this year! Not going to lie! I am going to use this for my hubby!!! Thanks for saving us some money! That is an awesome idea! Now I’ve got to print an extra copy for my hubby too. 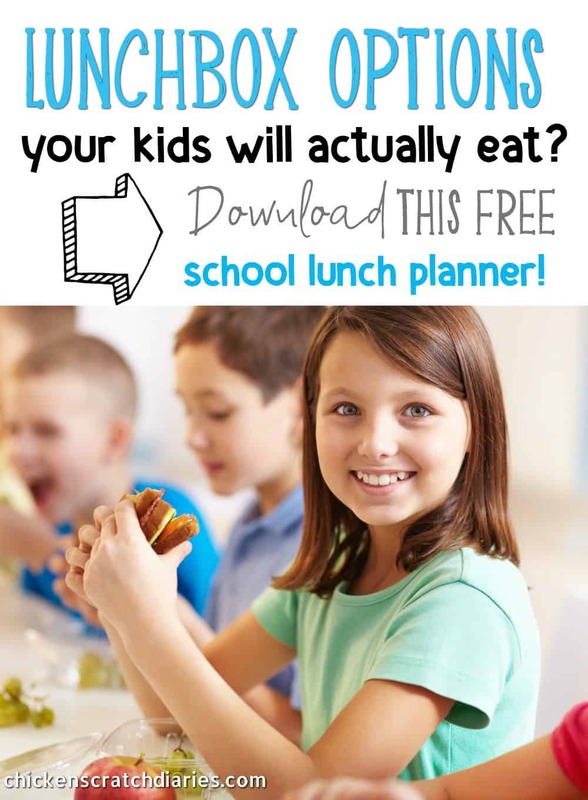 😉 It would work great for planning ANY lunches, you’re right! Thanks for stopping by! i love this! such a time (and sanity) saver! Thanks Ashley! I hope it’s helpful! We just started going over our lists at our house tonight, getting ready for the first day of school! Great idea! Really helpful, how have I never thought of this! Thanks. Thanks for the feedback Allie! Hi Stephanie, sorry you weren’t able to download — When you subscribed in the pink box above, it should send you an email asking you to confirm. Once you do that, the next email will have the download link. (You know, all those email rules requiring extra steps!). lol. Check your spam folder if you don’t see it there. And let me know if you still can’t download from there. Thank you!